Three wins from four for Harlequins in what was a gritty performance in the end ahead of the European fixtures. Sale have the consolation of a losing bonus point to take back up the M6 and will know on another night they could have won that. Thank you for your company, enjoy the rest of your night. So that is just about it for your rugby offering this Friday evening. Just another nudge in the direction of the BBC Sport website tomorrow where we'll be with you throughout the afternoon for four Premiership games. We've started the season really well but tonight was not a performance we can be proud of. Credit to Sale as I thought we were very lucky in the end to win that. We want to show people what we're about but on that they probably won't be afraid. Fair play to Quins in the second half they got back in the game and in control. I'm really pleased with the performance just not he result in the end. You look at some of the decisions and I think the penalty count was 13-2 at one stage to Harlequins. We get written off every year and we proved again tonight we're a good side. The four points for Harlequins moves them up to second in the Premiership ahead of the other round four fixtures. For their endeavours tonight and a losing bonus point, Sale are up to fifth and have two wins and two losses in their opening four games. I think we went in with right mindset, it was just a lack of execution hindered us getting that win. There were some tough calls but I think its about adapting to the ref about what you can and can't do. Danny Cipriani strikes a drop goal to end the match and it never had the legs or height to get over. Harlequins grind out a win against a stubborn Sale side who go away with a losing bonus point. We are in the last play of the game. Sale still with possession and going through the phases. Sale decide to run the ball from deep. Eventually the scrum is sorted, but Sale turn it around! The Sharks will have the put in now and have two minutes to try and work a points scoring position. From the resultant scrum with Harlequins put it, the scrum is reset twice. Conor O'Shea won't mind as this is eating up the clock towards 80 minutes. Simple handling error from Sale as they knock on through Magnus Lund. Director of rugby Steve Diamond does not look a happy man with that basic mistake. Harlequins immediately make Sale pay, driving deep with a driving maul from a line-out. Just as they look completely in control though, Sale win themselves a penalty and Danny Cipriani blasts it down the field. After working themselves into an excellent position, Danny Cirpiani just drags his kick wide for a chance to give Sale the lead again. Sale again go close, good work throwing it out of the tackle on successive occasions but Charlie Matthew rips it just in time and then hacks it away with a big left boot. Chris Robshaw finds himself in the unfamiliar role of full-back from another Mike Haley kick. He throws it out of the tackle and then Nick Evans' attempted clearance is charged down. What can Sale do here? You can visibly see the confidence come back into the Sale side now. Another bit of kicking tennis and Mike Haley's well weighted kick pushes Harlequins back into their own 22. Sam James is making a habit of scoring important tries. A drive from Josh Beaumont from the scrum, Sale recycle quickly and superb footwork from James and then dives over the line. His second try on his third Premiership start and Danny Cipriani adds the extras. Quote Message: What a brilliant tackle from Mike Brown. Danny Cipriani is putting those kicks in the corner like he was doing in the first half." What a brilliant tackle from Mike Brown. Danny Cipriani is putting those kicks in the corner like he was doing in the first half." Nearly a try for Sale from nothing. A grubber kick from Danny Cipriani is just kept in, it is hacked forward and Tom Arscott gathers he is brought down a metre away by Mike Brown. As Sam James tries to gather and jump over he is held up and Sale will have to settle for a scrum from close range. Sale working it through the phases at the moment enjoying lots of possession but the Harlequins defence is standing firm as the visitors struggle to cross the gain line. Harlequins opt not to jump at the line-out and it works for them as Sale are penalised in the way they form the driving maul, allowing Nick Evans to clear. Another penalty for Sale after that line-out and again they go to the corner instead of the posts. Can the Sharks make something this time? Sale win the ball back from their kick-off and with a few fresh faces they win themselves a penalty. A 13 point swing at the start of this second half as Harlequins take control of this game. The Quins pack win the penalty and Nick Evans kicks his third attempt from four so far. Sale are the contributors to their own downfall at the moment. Peter Stringer does brilliantly to tip the ball from Danny Care in a maul but as the Sharks then spin it into the middle Tommy Taylor knocks on under no pressure. The visitors have barely seen the ball yet in the second half. Quote Message: Brilliant execution there from Nick Evans and Tim Visser. What a pick up with a greasy ball." Brilliant execution there from Nick Evans and Tim Visser. What a pick up with a greasy ball." Much like Sale's try in the first half, knowing they have a penalty Harlequins fly-half Nick Evans kicks wide and as it bounces once it is a quite brilliant pick up from Tim Visser to cross - his first try for his new club. Kiwi Evans then knocks the conversion over out wide to cap an excellent start to the half for the hosts. Harlequins' back line beginning to click and they look like a different team now when they have the ball. A bit of noise from the home faithful as they at last have something to get excited about, but can they produce some points? Quote Message: It looks like Quins have managed to get their back three in the game for the first time. Quins are getting their dangerous runners in the game and challenging the Sale defence which we didn't really see in that first half." It looks like Quins have managed to get their back three in the game for the first time. Quins are getting their dangerous runners in the game and challenging the Sale defence which we didn't really see in that first half." A really good period of possession for Harlequins as they have their snap back with the ball in hand. A thrusting run from Chris Robshaw is halted but as Sale have the ball they then knock it on. This could be a big loss for Sale as captain and try scorer Dan Braid is taken off for Magnus Lund. He does not appear to be injured and Sharks director of rugby Steve Diamond looks to be explaining the decision to him. He is successful this time the Harlequins fly-half as the ball flies end over end from Nick Evans. Jonathan Mills is just slightly to eager to come through a ruck and concedes a penalty for Sale. First line-out of the second half does not quite go right for Harlequins as Dave Ward does not throw straight and Sale have a scrum. Sale forced into a change at half-time as Jonny Leota replaces centre Sam Tuitupou who has an Achilles problem. Nick Evans gets us going in the second half, can Harlequins improve? As well as enjoying the live text coverage, you can also listen to commentary of the game on BBC Radio London by using the 'Live Coverage' tab. Championship rugby is also available there where you can enjoy Moseley v Cornish Pirates (BBC Radio Cornwall) and Bristol Rugby v Doncaster (BBC Radio Bristol) should you wish. Elsewhere tomorrow, it is one of my favourite days in the sporting calender as the FA Cup first round takes place. Tonight, non-league Salford City are taking on Notts County while there are a host of other tasty ties to get your head around throughout the afternoon. As usual you can follow all of the action with us. So as we take a breather at the Twickenham Stoop, let me point you in the direction of the BBC Sport live text coverage from the Premiership tomorrow afternoon. The game that sticks out is a repeat of the 2013/14 Premiership final where Northampton will be hoping to open their new £6m stand by beating champions Saracens, but we shall have you covered wherever you are. One for the purists maybe, but Sale will very much be delighted with their first half showing. Intelligent kicking from Peter Stringer and Danny Cipriani has got them into good positions and an opportunist try from Dan Braid sees them lead. Harlequins look a shadow of the team that was so impressive at Bath, surely they will improve after the break? Nick Evans drags it wide and that is the last action from the first half. A line-out from Harlequins and a chance to end the half on top. The driving maul is set again and again Sale conceded a penalty... Nick Evans will go for goal. After his 28-point haul last week, Nick Evans gets Harlequins off the mark with two minutes left until the break. From the line-out, Harlequins get a penalty from the driving maul as Dan Braid is penalised. This time they will go for the sticks. Sale go so close to a second try. Sam James with another break, he passes one-handed to Danny Cipriani who throws it out to Nev Edwards, but the winger is brought down. From close range there is an accidental offside and Harlequins get the scrum. Quote Message: That's big for Quins. They'll be relieved that didn't go over." That's big for Quins. They'll be relieved that didn't go over." A long penalty kick from near the halfway line but Danny Cipriani slips as he strikes the ball and it doesn't have the legs. Probably his first mistake of the night. Often the tag Danny Cipriani is labelled with is that he cannot control a game in the way that George Ford or Owen Farrell can, but he has been superb so far with his tactical kicking. From a Sale attack the ball hits the referee and the visitors have a scrum... from which they win a penalty. Sale's driving maul has been a real weapon since Steve Diamond took control of the forwards and they rumble on 10m and then win themselves a scrum. It might not be free flowing rugby from the Sharks but they are growing into this one. Things just aren't quite clicking for Harlequins at the moment. Danny Care goes for a quick tap penalty and somehow knocks the ball on under not much pressure. Scrum to Sale in a decent attacking position. Dan Braid scored the only try of this fixture last season as Sale ground out a 16-12 win at the Stoop, can they produce something similar tonight. They are certainly on top at the moment as Danny Cipriani launches another huge kick into Harlequins half. After kicking the ball into touch from a penalty, Harlequins have line-out just outside the Sale 22 metre line. They knock it on and as we go over the halfway point of this first 40 minutes, Quins are yet to get anywhere near the Sale try-line. Quote Message: Very intelligent kick there from Danny Cipriani he knew he had the advantage coming. Visser couldn't quite catch it and Braid went over in the corner. Sale are on top and the pressure has resulted in that try." Very intelligent kick there from Danny Cipriani he knew he had the advantage coming. Visser couldn't quite catch it and Braid went over in the corner. Sale are on top and the pressure has resulted in that try." Knowing the penalty was coming, Sale fly-half Danny Cipriani hoists one into the air and as it is spilt by Tim Visser, captain Dan Braid grabs the ball and places down. Cipriani's conversion goes through off the upright, and what a start for Sale. There has been some intelligent kicking from Sale so far and there is another by Danny Cipriani to get near the Harlequins try line. Quote Message: The battle of the breakdown will be key tonight. The rucking so far has been very good, but I'd imagine there will be a few penalties later in the game." The battle of the breakdown will be key tonight. The rucking so far has been very good, but I'd imagine there will be a few penalties later in the game." It's a subdued atmosphere at the Twickenham Stoop at the moment and that is because Sale have had much more of the ball so far. Neither side is yet to really gain any territory to do anything with the ball in hand. Steve Diamond will arguably be the happier of the two coaches. Harlequins win the penalty from the scrum and from a very kickable length, they opt to go for touch. From the line-out though Sale win the penalty and can now clear their lines. Both teams just doing some jabbing at the moment and not really going for a knockout swing, with neither side yet to make a real impression. Another quick defensive line sees Harlequins pressure Sale with the ball and the knock on means it's a Quins scrum. Quote Message: Danny Cipriani is a very dangerous runner and his kicking is fantastic. He'll certainly be knocking on England's door again." Danny Cipriani is a very dangerous runner and his kicking is fantastic. He'll certainly be knocking on England's door again." They do and off the scrum it is a brilliant line from Sam James off a Danny Cipriani pass for Sale but his centre partner Sam Tuitupou knocks the ball on. It's the first put into the scrum for the visitors. Can they keep up their impressive record so far? There's been some big hits to start this game from the hosts. Charlie Matthews lines up Sale captain Dan Braid and takes man and ball but knocks it on. Quote Message: It's a bit of a cagey start. Hopefully it will open up a bit later on." It's a bit of a cagey start. Hopefully it will open up a bit later on." Good early take from the lineout by Sale and after the driving maul lost momentum, Peter Stringer kicks long. A good take by Mike Brown though and Harlequins kick to touch again. Kicking tennis from either side in the opening minute after Mike Haley is stripped of the ball on his first run. Marland Yarde finds a decent touch and Sale have the first line-out of the night. Danny Cipriani gets us going. Quote Message: The morale of the camp is really good. The guys are playing really well and had some good additions this year with the likes of Adam Jones, James Horwill and Tim Visser." The morale of the camp is really good. The guys are playing really well and had some good additions this year with the likes of Adam Jones, James Horwill and Tim Visser." 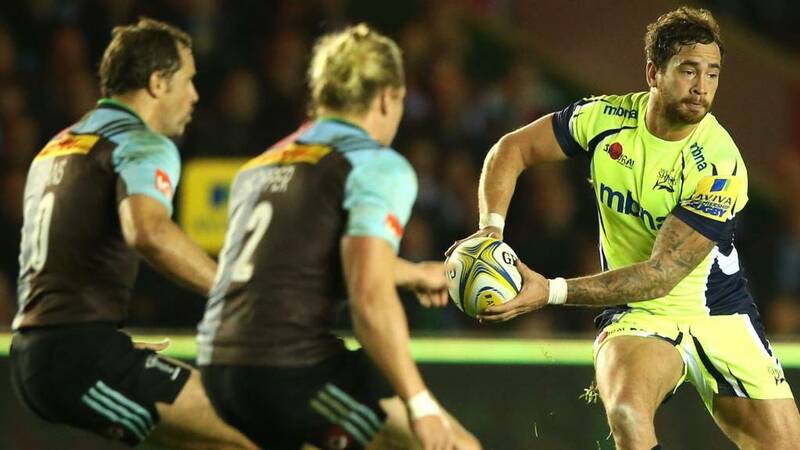 Sale Sharks, in their day-glo bright yellow kit, are led out by Dan Braid before Danny Care leads out Harlequins for the first time at the Twickenham Stoop. The warm ups are done and the teams are getting their final instructions in the changing rooms. Lots of intriguing battles tonight, but has anyone spotted England captain Chris Robshaw wearing number six tonight for Harlequins? Luke Wallace is starting as openside flanker keeping the man who had the number seven shirt at the World Cup. It can be hard being the son of a legend, but Sale number eight Josh Beaumont seems to take it all in his stride following in the footsteps of his dad Bill who captained both England and the Lions. His impressive form last season saw him play for an England XV against the Barbarians in the summer and he's already scored one try this term as well as leading the lineout stats. We've spoke about Slammin' Sam, there has been lots reaction to the news that he is quitting rugby union after one year to return to South Sydney Rabbitohs. The 26-year-old cross-code international says it was missing his family that was the drive behind his move, but former England head coach Clive Woodward says English rugby union is a "laughing stock." ...some players get better with age, and Harlequins fly-half Nick Evans is still at the top of his game at the age of 35. The former New Zealand international has started the season in impressive fashion including his glut of points last Saturday. What do you make of Sam Burgess' decision to move back to rugby league? Will Harlequins be too much for Sale? Is Danny Cipriani the most handsome man in rugby? Whatever your thoughts, you can share them with us tonight using #bbcrugby. Sale hand first starts of the season to summer recruits Peter Stringer and Nev Edwards, while Sam Tuitupou comes in for Jonny Leota and inside centre. Youngster Sam James keeps his place at outside centre after his excellent try against Northampton, as the Sharks look for three wins in a row. No last minute changes announced for either side so Harlequins make four changes to the team that won impressively at Bath. Dave Ward, Will Collier and Charlie Matthews come into the pack while Matt Hopper replaces Harry Sloan at centre. Round four of the Premiership action starts at the Twickenham Stoop as Harlequins welcome Sale Sharks. Both these sides have won two of their opening three fixtures so far and sit on nine points, but who will have a third win of the 2015/16 season by the end of the evening?